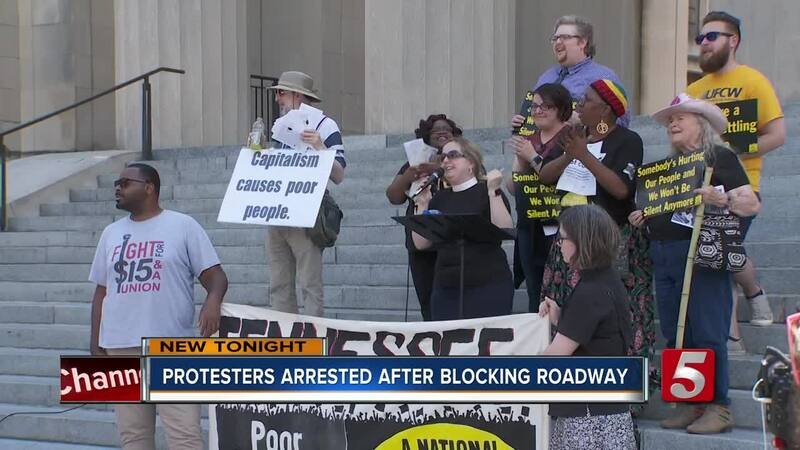 Multiple arrests were made during the Poor People's Campaign protest at Legislative Plaza in downtown Nashville. The group gathered, about 100 people in all, to call for the restoration of the Voting Rights Act and an end to racial inequality. As many gathered behind police lines in designated protest areas, others reportedly refused to get out of the road. Representatives of the Poor People's Campaign said the group of about 20 were marching to the courthouse to lock it down when they were taken into custody. Several people were restrained with flex cuffs and led away from the protest. It was not yet clear what charges they may face. The protests have been taking place nationwide in 35 states for slightly more than a week. The previous Monday, protesters shut down James Robertson Parkway bridge during rush hour . That was for the fist week of non-violent protests calling for change.